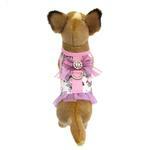 Give your pooch a feminine and stylish look with the Victoria Dog Harness from Pooch Outfitters! Floral design on dog harness. 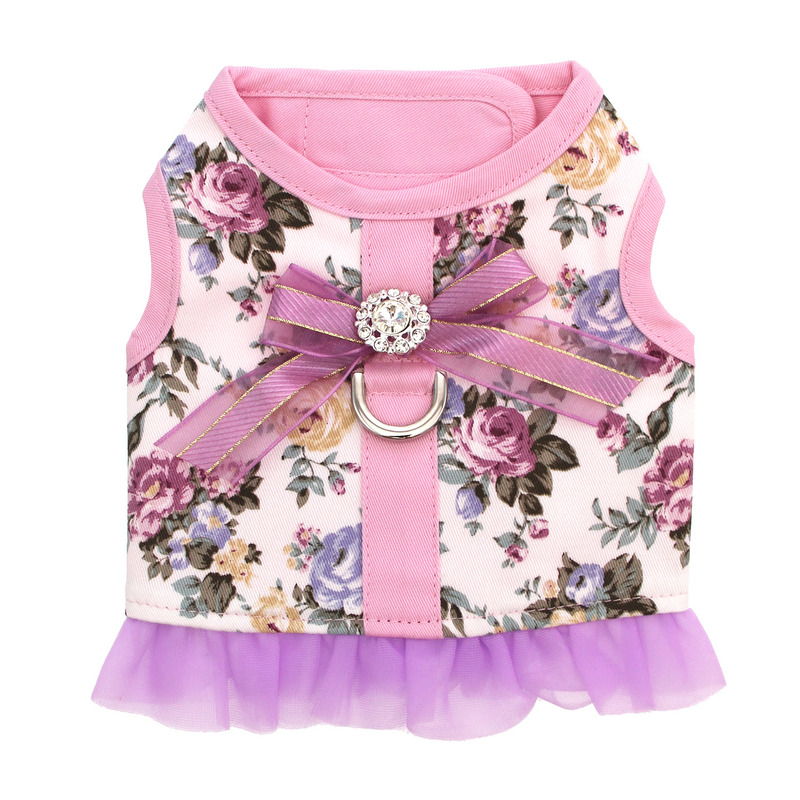 Your pretty pooch will be in bloom and be spreading love and good wishes in this charming floral-covered dog harness! The antique rose pattern is a nod towards gentler, more refined times filled with tea parties, garden gatherings, and good books. Feminine details such as a sheer gold-gilded mauve bow and rhinestone antique-style button accent add grace and charm. The soft chiffon ruffle gives this harness the look of a dress without the fuss. 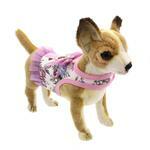 This beautiful harness by Pooch Outfitters is simply precious, but we love it for more than just its looks. This harness combines beauty, form, and function by making sure your pup is safe on walks. With sturdy hook and loop closures at the neck and tummy, pulling pressure will be distributed over the chest and shoulders to lessen the chance for neck injuries and choking hazards. Additionally, the smooth finished edges prevent chafing, and the heavy-duty D-ring attachment ensures a sturdy leash attachment. Victoria Dog Harness - Purple Customer Photos - Send us your photo! This is just one of two pictures I'll be posting of this product. I LOVE IT! More importantly, so does Paisley!! :) This 'lil bundle of joy (all 1.7 pounds of her) picked me to be her new mommy. I've been anxiously waiting to bring her home since the day she was born in mid-April! With her arrival pending, I immediately ordered this Victoria Dog Harness - Purple in XXS a little over a month ago just waiting for the day I could put in on her. That day finally came on June 3rd! She's completely stolen and filled my broken heart (and I'm in constant awe of her gorgeous eyes!) This harness vest is PERFECT for her tiny size right now as well as the purple floral fitting well with the reason for her name (although I'll imagine I'm going to need another one when she really begins growing!). Thank you, BaxterBoo, this will be my second baby (sadly, my infamous Chica passed away on Jan 1st) that you'll have dressed like the star she was just born to be! P.S. Even her bed is a BaxterBoo product I bought years ago, it's an igloo, but she prefers it as a bed - another amazing product (sadly no longer available, though). And noooo, she's not spoiled at all [as my nose grows longer]. This was her outfit for her first birthday. Everyone loved it. Posted On 06/22/18 by Ronda from , OH Yes, Ronda recommends this product! I reviewed this once already so I don't expect another 5 points for this but HAD to share my experience last night. My young pup (Chihuahua) decided, as they do, she was bigger than she is and tried jumping out of my arms when I reached the porch carrying her to go outside. Luckily I had the leash attached to this harness and was able to hold her "dangling" so she didn't fall a 5' plus fall onto the cement. This harness possibly saved my pup's life and definitely saved her from any type of injury because of how it's made (thick/wide velcro that allows for it to be evenly distributed in her chest/back, not having strips of nylon as some harnesses that could have dug into her and hurt who knows what internally). I hope the Pooch Fitters vests like this remain a standing product because I truly believe in their safety AND know how tough they are first hand now. Pup is perfectly fine and had she had on a collar or a not so great harness, I can't even fathom the potential outcome! Posted On 06/08/18 by Ronda from , OH Yes, Ronda recommends this product! Beautiful harness vest for my Paisley girl (who is an 8 week old, 1.7 pound Chihuahua). The XXS fits well but it won't be long before I suspect she'll need an XS (then possibly a S). It's so easy to get on a squirmy pup but best of all, it's comfortable to leave on her so I'm not rushing and fumbling trying to get the 'lil one in the harness then attach the leash to get her outside before she has a woops in the house (or on me in the process)! VERY well make with sturdy but soft material. As my 'lil Paisley grows, I hope this stays in stock because it just suits her perfectly! Posted On 11/29/17 by Patti from North Hollywood, CA Yes, Patti recommends this product! Love it. Excellent quality, and beautiful. Rosie wears it like a true fashionista! I initially ordered the Eva, but received a phone call that Rosie's size was out of stock. When I first placed the order, I was undecided between the Eva and the Victoria, so when I learned the Eva was out of stock I asked for the Victoria. Rosie's size is exactly between XS and S so I ordered both sizes and will return the one one that doesn’t fit. I placed the order Monday, and got it Wednesday. The XS fit Rosie around the neck, but was too small around the waist, while the S fit perfectly perfectly around the waist, but a little too long around the neck! The overhang around the neck can be easily corrected by installing a decorative snap or button to hold it down, which will even further enhance the lovely harness. I’m very pleased with the quality and service of BaxterBoo, and am sure I’ll be back on their website ordering from them again! I'd love to post a photo, but couldn't find a link. Love it. Excellent quality, and beautiful. Rosie wears it like a true fashionista! I initially ordered the Eva, but received a phone call that Rosie's size was out of stock. When I first placed the order, I was undecided between the Eva and the Victoria, so when I learned the Eva was out of stock I asked them to send the Victoria. Rosie's size is exactly between XS and S so I ordered both sizes and will return the one one that doesn’t fit. I placed the order Monday, and got it Wednesday. The XS fit Rosie around the neck, but was too small around the waist, while the S fit perfectly perfectly around the waist, but a little too long around the neck! The overhang around the neck can be easily corrected by installing a decorative snap or button to hold it down, which will even further enhance the lovely harness. I’m very pleased with the quality and service of BaxterBoo, and am sure I’ll be back on their website ordering from them again! Posted On 10/05/17 by Nancy M from Little Rock, AR Yes, Nancy M recommends this product! So cute on my little Chihuahua. I was impressed by the quality and strength of the material. Stitching also was perfect. Worth every penny. Especially if you have an event to go to she will be so envied by everyone there. Posted On 09/01/17 by Molly C from , Yes, Molly C recommends this product! This harness is fancy. It is beautiful!! I love the detailing with the bow and little bit of bling. My little one looks so cute in it!!! This is real dainty and beautiful. The workmanship is very good and pretty enough to wear to a wedding and any special occasion. Posted On 06/16/17 by Deborah & Rami Kawar from Spring Creek, NV Yes, Deborah & Rami Kawar recommends this product! Very cute vest and well made. Size XS. This adorable outfit fit my little 5 pound Yorkie perfectly. Very well made and easy to put on. At first Chloe and I had a little wrestling match to put it on (as usual) then of course she pranced and played around like she was a little princess in her beautiful outfit! We went out to a party and of course she received a lot of attention and compliments on her pretty little purple vest. Posted On 08/26/16 by Cheryl B from Winter Garden, FL Yes, Cheryl B recommends this product! This harness is so adorable ! It's probably my favorite . Make sure you measure your pup first. Stylish and elegant. I also have the Penelope harness. Love them for special occasions. I like that you carry a lot of styles that I haven't seen elsewhere. Unfortunately some of what I like and would have purchased are out of stock. Maybe next time.